I love looking at Fred Lynch’s collection of Frony pictures, including the February 22 photo of Kent Library from the 1940s. His f/8 and Be There blog makes my job easier. They jog my memory about things I’ve shot. 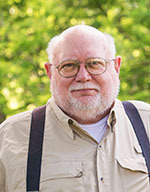 He and Sharon Sanders do all the research I’m too lazy to do. 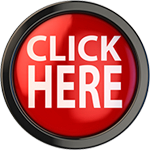 Instead of doing a lot of writing, I can send you directly to the work they’ve done. This one is powered by Google Maps. Click on the hybrid option it will overlay a satellite view and a street map. This is a printable map of parking areas with the buildings identified. It’s not oriented with north at the top, so it took me a minute to figure it out. 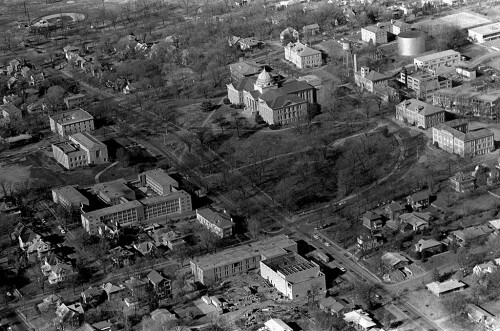 The photo above shows Kent Library in the upper left corner. Dearmont Hall is to its right. 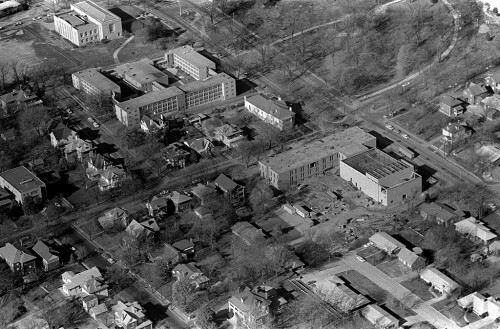 The Grauel Building is under construction at bottom right. 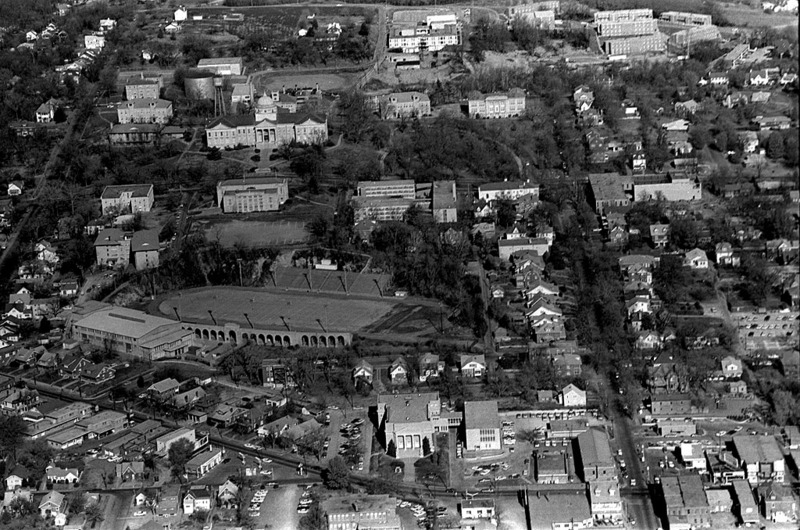 This photo, from a slightly wider angle, picks up Academic Hall in the center, , then clockwise to College High School, the Grauel Building at the bottom, Dearmont Hall, Kent Library and the baseball field at Capaha Park at top left. This photo centers on Houck Stadium and Houck Field House, but includes the intersection of Broadway and Pacific at the bottom right. 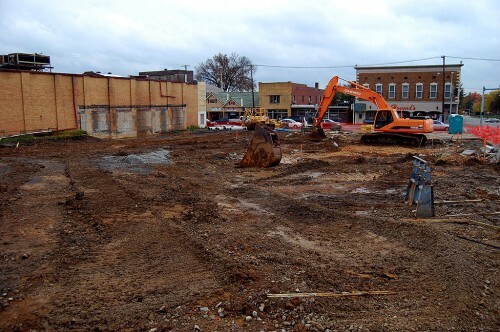 You can see Howard’s Sporting Goods, the Esquire Theater and Vandeven’s Merchantile. There’s a two-story building at the southwest corner of Pacific and Broadway, across the street from Howard’s, that is no longer there. I can remember there was a tiny gap between it and the building to its west that was just large enough for a kid to walk through. Here’s what The Missourian had to say about it. In the mid-1800s, Frank C. Krueger purchased property on the southwest corner of Harmony (now known as Broadway) and Pacific Street. It has been said the Krueger erected the building that once stood at the end of Cape Girardeau’s city limit during the 19th century. Broadway to the west of Pacific Street was a gravel road known as Jackson Road. Krueger opened up a general store on the east side of the building, and he established a saloon on the west side. It soon became known as the “Last Chance” saloon headed west out of Cape Girardeau and the “First Chance” as one entered town. The saloon provided the last chance to have a drink when leaving Cape Girardeau and first chance upon entering town. Krueger died in 1882, and the building saw several proprietors after that. In the 1920s, the east section — 901 Broadway — housed Miller & Foeste grocery for many years. In the 1940s, the Last Chance Tavern opened on the east side. Oscar Becker operated the Last Chance Pool Hall on the west side — 903 Broadway — for more than 45 years. In the later years of the building, it would house a restaurant and pizza business before returning to a tavern, called the “Second Chance.” In November 1994, the building was razed. 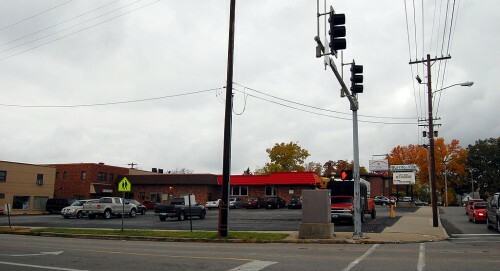 Three buildings north of the intersection, on the right-hand side of the street is a two-story brick building that was a bottling company. I wish I knew more about it. A good chunk of that area has been gobbled up by the university for parking. This is the southwest corner of Pacific and Broadway on Oct. 28, 2009. The Last Chance – First Chance – Second Chance Saloon is gone, replaced by BurritoVille and some other businesses. I guess that may not be much of a loss. When Son Matt and his family visited Cape in 2008, he gave BurritoVille a rave review on my bike blog. The Esquire Theater is on the left and Howard’s / Craftsman Building / Vandeven’s Mercantile (depends on your era) is across the street. The western most part of that building had a dance studio in the 1950’s for a while. Evelyn Bissett ran the studio. I remember it well because I took dance lessons there. For one of the Marquette Cement publications they featured the Cape plant and families were included. I still have the picture of 4 or 5 of us who were taking dance lessons. I know Mary Ellen Lewis was one of the girls, but I can’t remember who the others were with us. When I find the picture sometime I will send it on to Margi for the 60’s page. 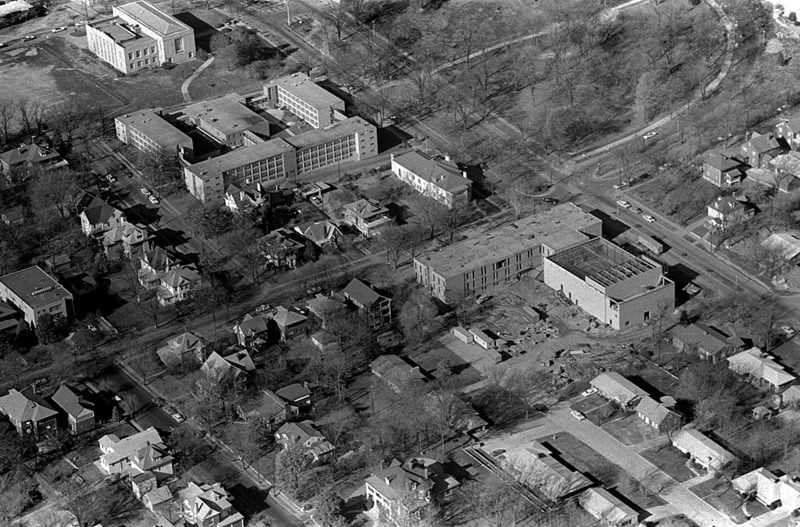 I see my old dorm–Leming Hall–in two of your aerial views. It was west of Kent Library. They tore it down to build the University Center, which (I admit) is a much more practical building, though I loved Leming. The stone walls made it cool in the summertime, even without air conditioning. I’ve often wondered what they did with the heavy monogrammed dishes that were left behind in the abandoned kitchen, where we had dorm meetings. My husband and I were “pinned” on the front porch of the dorm, accompanied by torch-holding Pi Kappa Alphas. Great memories. I wish I had more photos! I lived above the “chance” in the 70’s. Way up top on the street side. Pigeons lived on the other topside. Bob Burgess, manager of the bar, lived below me. I bartended there several years till I graduated. What a place. Competed against the pladium then. I give the chance the edge. Had the college guys/ gals nights and weekends, the locals came in late day after work for a peaceful drink before the kiddies arrived. Carl Mamanella owned it then.